What!? I saw it on a Disney movie once? It was the best I could come up with. There were a few chuckles, I promise. Almost two hours of more safari driving in the reserve than actual rhino trekking and the humor was starting to take pace with the jeep’s bumps and grinds along the dirt road. The jokes were getting better…Or worse. However you look at it, we were getting tired, especially since the thunderclouds had made rain appear on again, then off again for the last 40 minutes. Finally we got out of the jeep and the guide at last said the words we longed to hear: “These are fresh! It is time to go trekking.” Not even five minutes later, and the glorious creatures were in front of us. We definitely thought it was time to take some important photographs so we measured exactly how close the white rhino was behind us with composed faces and length of arm. See? Having a serious look. That’s right. A serious look at the wildlife. After our precise documentation, we stealthily got back into the vehicle between whispers of “There’s a stick in my boots!” and “Pull my string? The birthday party’s today!” (Still the wrong movie for an African safari but oh well. They should put a rhino in, next time.) After a swift drive, our guide pulled off the main road in front of a large lagoon. The sun was finally high at midday and as many of the Gaborone days had been filled with rain and lightning, it was a delightful change. We all presumed that we were going back to the gift shop after our brief dearth with the dangerous and great rhino. We were surprised to discover that the guide simply wanted to feed us! It was very unexpected and so the sandwiches were devoured perhaps even faster because of our hard work becoming zoologist explorers. As we made our way back to Gaborone a few moments later, I couldn’t help thinking that the venture’s highlight was hearing comments about wildlife and their particular perfume. *Snicker. Call me sentimental, but I find the less profound moments are often the best ones! The next few days flew by and it is safe to say that even Christmas was a brief spot of holiday cheer in an otherwise quick blur of meetings and dinners. The night before the wedding, which was to be a two-day affair, a few of us were up late sharing wine by the pool under a star-filled evening sky. Thunderclouds rolled in the distance and occasionally our pet peacock would strut by screeching but otherwise, it was a quiet and serene evening. The night was soon punctuated with an unexpected amount of drama. The first day of the wedding was supposed to begin at 5:00am the next morning, and as four of us could only attend day two because we were unmarried, as was custom in Botswana, we were enjoying a night as young as we were. B’s mom came home to the lodge after the final elder meeting with an insistence that all of us were attending both days. As the wedding would begin in four hours, it was a not a small shock! Everyone promptly rushed to take a quick nap before dawn. Sleepily rustling up courage to get up, all the women pulled on scarves and secured them around their heads along with trousers or dresses for the ceremony. As is customary in Gaborone, the Tswana family unit is divided into male and female domains. The men own the kraal while the women dominate the home. As we approached the home, there was a large circle of females singing and clapping, which could be heard for miles around the homestead. All the women were dressed in royal blue, and a homestead dresses its community in a color that symbolizes where they are from. 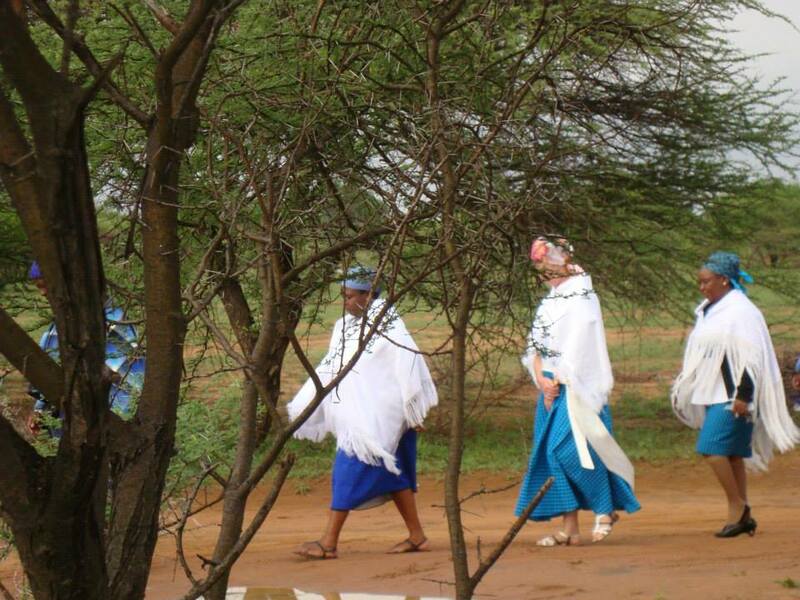 Women walk through the homestead in Gaborone, Botswana. Most women were adorned with a similar dark headscarf with an argyle-like pattern and azure skirts that matched. The few exceptions were women who had married into Gaborone and represented the homestead their parents were from. Most of the women who did not wear the azul dresses were wearing pearl white. The bride was conspicuously absent and she appeared later as a strange ghost-like figured dressed in a large pink blanket that covered her entirely head to toe. From my understanding, the bride is to be a hidden gift the husband needs to find simply by guessing who she is. She is placed next to at least two other girls who are also adorned in similar attire as a test for her husband-to-be. B was supposed to choose which of the women is his betrothed. Interestingly enough, one of the Patlo negotiations seems to have given B the right not to choose. There was only one covered woman at this ceremony. As an observer, I think it makes it more special not to choose as this means there is only man and woman potentially getting married. 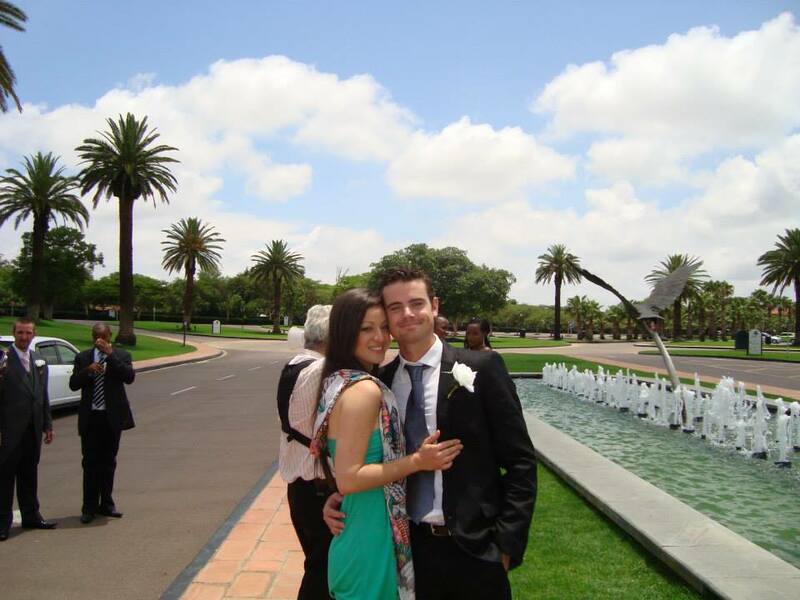 So for all rights and purposes, this was a very modern Botswana wedding. My favourite aspect of the first day was the singing. The women made a strong, courageous yell with their tongues for an hour-long singing session where they screamed in an undecipherable dialogue to my ears. The best part was that their mouths were shaped in this oval shape, identical to each female while the tongue wagged back and forth so quickly left and right, their jaws vibrating in simultaneous succession while they jumped and danced in a circle around the porch of the house. Just inside the short, stone walls of the front veranda, three of us stood and watched as we were within the confines of the house but outside the dancing. We stood with our colourful scarves covering our heads and smiling, laughing, clapping. None of us could speak Setswana, so we just listened to the sounds and could not stop grinning. Every moment, one of the Tswana women would lean over and translate in whispers to us as they again lifted their voices high: “They are saying, ‘She must sweep his floors/ She must sweep her mother’s floors/ She must be afraid of Ireland/ She must go with her husband to Ireland/ She must bear a child for him / She will carry the child/ She will carry the child on her back.’” It was magic. 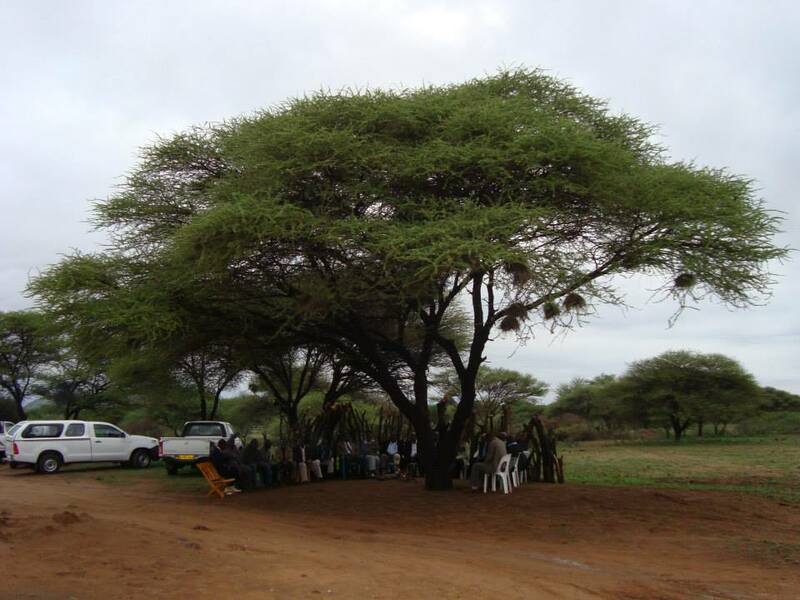 The kraal was situated under the shade of a large tree where the men sat and talked. Where were the men all this time? The men were at the kraal, speaking of the ritual slaughtering of the cattle which had been purchased for the appointed time at the wedding. As the women were separated for several hours during the ceremony, I did not have the opportunity to observe how this discussion was carried but it did go on for more than two hours around a bonfire. The fire and smoke was still elegantly petering off the trees when the women made their way across the homestead to greet the men at the end of the ceremony. This is an interesting tradition considering that the fire is begun even as the sun rises at dawn. Besides the fact that there is no actual need for the fire to make things visible in darkness, it is also stifling hot during this time of year. After the conversation about the ritual bulls, the most important part of the discussion commenced. All the married men and elders gave B advice on how to be a good husband. As one who is naïve in the ways of marriage, I found this romantic in spite of its old origins, even though the bride was absent during this time. The women mirrored this aspect of the ceremony during the blanket presentation of the bride, P, and told her the ways in which she must treat her husband well and what to expect throughout her marriage. After the singing, the bride entered, her face now visible and fresh. She was uncovered and serving women came to hand tea and biscuits to each of the ladies while the transformation happened so the bride could be ‘handed’ to her husband. Firstly, the men came to the front of the bride’s house and stamped defiantly on the entrance with their boots, as if to show that they were now entering the female domain for the first time. Only B, his father and the two representatives of the bride’s male family came. The rest of the men watched from afar as the men came and gave greetings and blessings to each female. They numbered close to 100 women. It was a sight to see as both the men and women demonstrably smiled from ear to ear, finally able to unite even if in a gesture of a handshake. The entire ceremony was as if a dance, carefully choreographed to mimic the movements of how a husband and wife can and will act in a marriage when the wedding is over. The men then walked solemnly back to the kraal, and the women began another song as they paraded back to a second house which was a few kilometres away in another homestead. At this point, the sun had been high for over an hour and I was dressed in my conservative long-sleeved blouse and skirt in order to respect the Tswana traditions that were being held that morning. 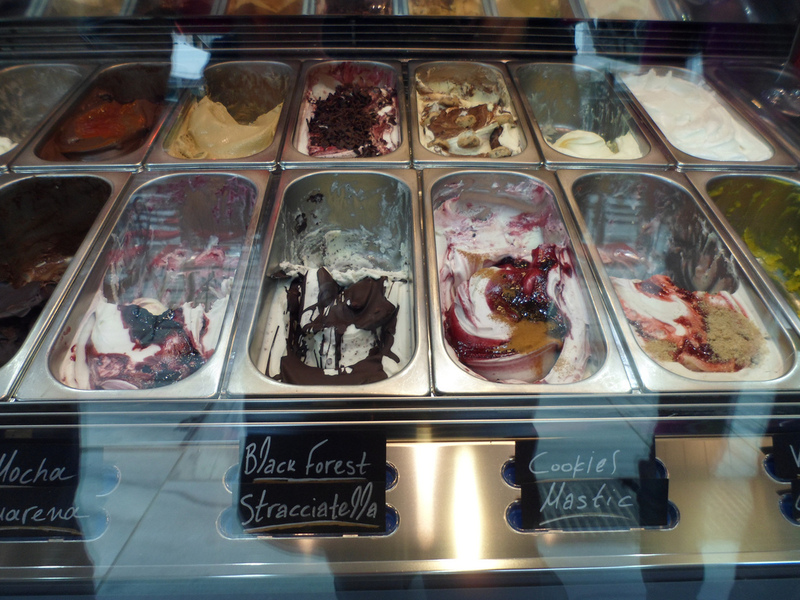 I was longing for some of that delicious gelato I’d had just one year ago. What is better to make things cool when it is hot? 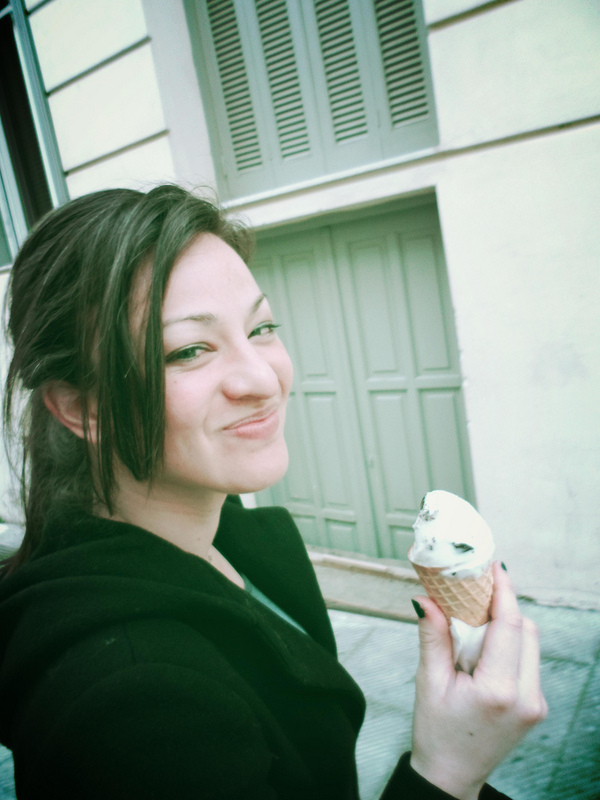 Gelato in Athens, Greece on a hot Spring day. The end of the ceremony was at 9:30 am and several of us returned to the lodge for a swim or a nap. Seeing as most holiday-makers don’t need to wake up at 4:30 for a 5:00 am wedding during their Christmas vacation, a few of us opted for the former rather than the latter choice knowing there was another ceremony tomorrow. My partner in crime, D, got the call for assistance from the groom as another Patlo meeting was called last minute asking B to come back to the Botswana homestead once more. This meeting lasted a few hours as there was a final request for B to stay in the village the night before the next ceremony. While the rest of the Irish family went to an elegant Chinese dinner at the local Grand Palms, Patlo lasted a while and eventually ended with B sneaking out the window and driving away in his car to join his family at the lodge. Exciting! Disaster. This went on for a ½ hour. Finally, we piled into a car where a caravan of ten vehicles made their way to the church. 8:00 am. After a thirty minute stint inside the chapel, (Is there a theme to this?) the wedding began with a line of men and women who filed through the center aisle singing in a very memorable American Southern gospel style while they toe-tapped back and forth in a very subtle dance before the bridesmaids. This was the best part of the wedding. Chanting and humming, they continued until both B and P stood at the altar. Three hours later, B and P were man and wife, minus a few harrowing incidents with a baby who wouldn’t stop screaming during the exchange of the vows. Poor B. A few notes on the service: The Christian ceremony itself had the intention, I’m certain, of uniting a man and woman in love. These are good intentions. Unfortunately there was such a strong emphasis on how “ it is not good for a man to be alone” through demonstrations (Indeed the phrase itself was repeated nearly seven times) of his inability to commit actions without sorrow or frustration if he did not have a wife i.e. sewing clothes and cooking in his household. In a country that has progressed so much in its economic prospects, there is a reason why Botswana is unique. It unites tradition with modernity in a very strange way and you could readily observe this through its pairing of Christianity with ancient tribal patriarchy. It was obvious that the wedding was meant to be symbolic of a man as the leader who could take care of his own affairs but the home was the dominion of the woman to support him, rather than traverse life through an equal partnership where man and woman choose a life together not of necessity but commitment. While there were many Christians in this audience, both Protestant and Catholic alike from Botswana, Ireland, Canada and other countries it was commented on from nearly everyone who knew B that this wedding ceremony was steeped in ancient traditions and indeed that it was actually “hilarious” that “It is not good for a man to be alone.” Is it possible to get married because it is a choice not just because it is “not good” to be without a partner? Certainly. An educated woman myself, there is not doubt that I could not align with the thoughts of the pastor. Despite the fact that the pastor used Biblical references, he did not properly use them to support his points and there was no mention of unconditional love, patience, or kindness, These are clearly the Christian virtues one should remember when bringing two people together not just for biological connection and reproduction, as well as “not being lonely.” Regardless, it was noted from most in the audience that it was an educational experience. I, for one, found the ceremony to be a pure African wedding experience that I was able to laugh about just days later on New Year’s eve with a few South Africans, who said we really “got a serious wedding!” It was hot but we survived a few more hours in an open-air tent after photographs at the Grand Palms Hotel and a celebratory cocktail. D and myself at The Grand Palms in Gabarone, Botswana. The vibe was high with enthusiasm and the Irish even sang a few songs like Patty Works on the Railway in Gaelic and English with a guitarist and solo by my D. Impressive. There were a few more hours of the bridal choir and their chants in a be-decked white tent housing 400 Setswana, 15-20 Irish, non-alcoholic champagne which no one drank (ew!) and a few speeches by the groom’s father, G, followed by a few others, who made some lovely comments about how P was already part of the Irish family and that they felt welcomed in Botswana despite their European roots. Unfortunately the Tswana chaos dissolved into eruptions of chatter through the best man’s quite humorous speech and bride’s father and his words…people walked back and worth, laughing, chortling and picking up their plates for food even though it wasn’t time to eat. In Botswana culture, though, it isn’t disrespectful it is simply part of the wedding. Be boisterous, be joyful, be loud, be late! Be how you want to be. It is all one big party! The important thing is that B smiled the whole way through. He had married the woman he loved and he had survived all the tests of the in-laws from culture, religion, and tradition. Now that’s a brave one. After hours in the sunshine, gelato is the perfect anecdote to a hot day (Athens). For the rest of us, we waited until 5:00 pm when the second and final wedding reception party began….and in this one the Westerners were now singing and dancing not just for a few minutes, but several hours. I got roped into the whooping and jumping in Irish dancing which is difficult when you’re an American! The party went on till it was just D, myself and the best man gazing at the evening sky with empty tables, soiree sparkling-wine flutes next to us and fireflies blinking nearby. There was also real champagne! I definitely had a glass. It never tasted so good. Previous PostDancing inspired by beautiful placesNext PostDoes passion mean there is meaning? Seems like African weddings are very messy but didn’t it bother you? !